Templeton band members successful at state - Hamilton School District. 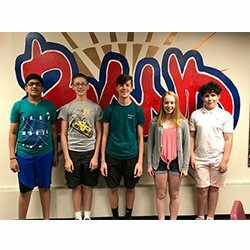 Five Templeton Middle School Band members competed April 28 in the state-level Wisconsin State Music Association Solo and Ensemble Festival held on the University of Wisconsin-Milwaukee campus. Pranav Karra, snare drum solo, Spencer Margolis, French horn solo and Nicholas Peterson, snare drum solo, earned the highest rating of 1 at state competition. Receiving a 2 rating of very good were Emily Nielsen, flute solo and Connor Tohulka, tenor sax solo. David Neubauer is the Templeton Middle School director of instrumental music.